Butterflies alight amid cherry blossoms against a scarlet sky. 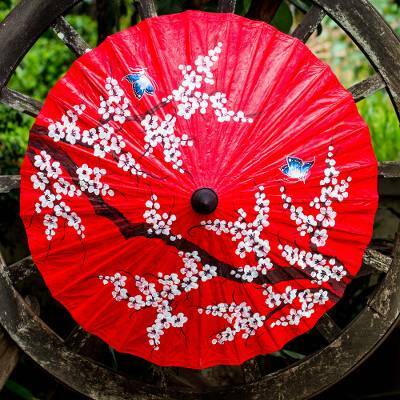 By Nikom, this delightful parasol is crafted of bamboo and handmade saa, or mulberry bark paper. You can find saa paper parasol 'Cherry Blossoms' by Nikom in decor accessories categories such as Animal Themed Home Accents, Floral Home Accents, East meets West Home Accents, Eco-Friendly Home Accents, Bamboo Home Accents and Paper Home Accents. Enjoy exploring these sections for other Novica treasures.